A tweet from UK developer CMA Megacorp first identified a quirk in the iPhone 5 touchscreen that hadn’t previously been reported – a glitch that causes the iPhone 5 to stop responding to rapid diagonal swipes. Slide finger back and forth diagonally on screen, input events drop out or stop altogether. 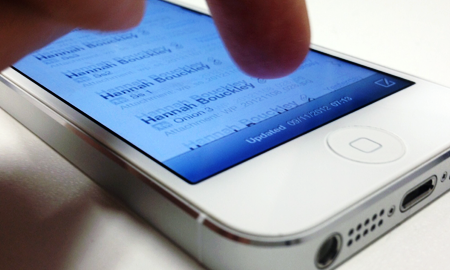 The bug causes input from the touchscreen to simply ‘drop out’, with the iPhone 5 failing to respond to further swipes when scrolling quickly with diagonal gestures. The strange behavior, unique to the iPhone 5, has been noted in several different apps including Mail, Contacts, Tweetbot and Brushes. The issue has also been identified in the fifth-generation iPod Touch and may be related to the new in-cell technology present in both the iPhone 5 and the new Touch. The bug has been reported on several different versions of iOS (6, 6.01 and 6.1 beta), so it doesn’t appear to be due to a single software issue. The fact that this subtle glitch in the touch-screen interface has not been noticed before now means that it is unlikely to have much impact on day-to-day usage for most iPhone 5 owners. If the issue translates across to games, where repetitive, angled swipes are required (e.g. Fruit Ninja) then this may cause a problem for both developers and users. The following video from Recombu compares the same diagonal swiping gestures on several different iPhone models, showing that the problem is unique to the iPhone 5.